Web accessibility means designing or adapting your collection of digital tools and technologies—including websites, mobile phone apps, and smart speakers—so they can be easily used by people with disabilities. They allow users to perceive, comprehend, navigate, and interact online. Accessibility includes any disabilities that would prohibit access to the web, such as visual, auditory, speech, physical, cognitive, and neurological disabilities. Accessibility also allows you to more easily achieve optimization for mobile, smart watches, smart TVs, and other devices with small screens and different input modes. As the World Wide Web turns 30 this year, it has become a nearly indispensable part of our collective lives, from employment to healthcare, education to government. These essential services must be accessible to the widest possible audience in order to provide a level playing field for people of all abilities. Web technology has the potential to make up for deficiencies in print, audio, and visual accessibility, particularly in the areas of mobile design, usability, and SEO. It also can bring lower maintenance costs, a wider audience reach, and an improved corporate social responsibility (CSR) profile, all of which help your bottom line. What are the ADA requirements? Established in 1990, the Americans with Disabilities Act (ADA) makes it illegal for any business or government entity to provide products or services that are not accessible to people with disabilities. The idea behind this law is quite simple—if the general public can order a product at any time of day or night or apply for a job online, this functionality must be available to all users, regardless of ability, particularly when the technology to accomplish this already exists. The section of the ADA relevant to web accessibility is Title III, which establishes that “public accommodations”—any nonprofit organization or business that serves the public—must be accessible, regardless of digital format. The DOJ has confirmed that the ADA applies to public accommodation websites. Why are there so many lawsuits? The ADA doesn’t provide clear standards for compliance or a timeline for completion. Enforcement is, therefore, left to the courts, which has created a patchwork of unclear standards. Plaintiff attorneys can recoup their fees under the ADA, so favorable conditions exist to file claims. Why are certain industries more heavily targeted? Industries that are integral to our everyday lives—retail, healthcare, hospitality, food service—often find themselves the target of legal action, sometimes multiple times. Plaintiffs and their attorneys often file cases in batches and may go after certain industries, such as boating, wineries, or golf courses, all of which have been targeted in recent months. What are the Web Content Accessibility Guidelines? 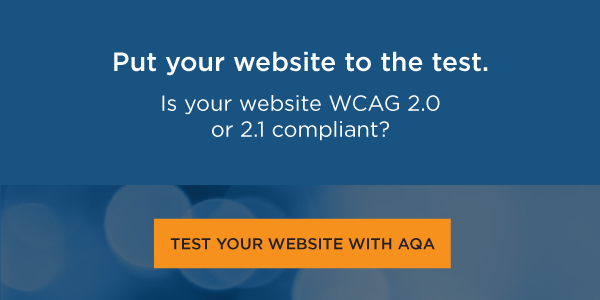 The Web Content Accessibility Guidelines (WCAG) were developed in order to establish a single, shared standard for web content accessibility that would apply to organizations, individuals, and governments across the globe. Operable: Users must be able to operate the interface components and navigation. Understandable: Information and the operation of the user interface must be understandable. Robust: Content must be robust enough that it can be interpreted reliably by a wide variety of user agents, including assistive technologies, and must remain current as technologies evolve. What are the incentives for compliance? Avoid becoming another casualty in the ever-escalating tsunami of lawsuits being brought by plaintiffs across a wide variety of industries. Make your site available to the many nondisabled users mentioned earlier. Grow your customer base and become a trusted, proactive community partner. Web accessibility requires that multiple elements come together, including browsers, users, design platforms, mobile apps, and the websites themselves. Accessibility is most easily achieved when incorporated at the start of a project, across all teams of an organization. The W3C Web Accessibility Initiative (WAI) provides the international standards for web accessibility through guidelines, techniques, technical specifications, and supporting resources. Evaluation is a key component of accessibility implementation. While there are automated tools to help move the process along, knowledgeable human evaluation is required to ensure true accessibility. UsableNet’s AQA solution can be a key resource for testing. No. See some of our writings on this topic. How do I become fully compliant? Yes, you can update your site’s accessibility on your own, but it can be a monumental task that eats up valuable time and resources. The right technology partner can make this process smooth and worry-free. UsableNet Assistive is a fully managed service that dynamically remediates your site to ensure WCAG 2.0 or 2.1 AA conformance and improve accessibility for all users. Accessible sites are tested for usability by user testers who are daily users of assistive technology. UsableNet AQA integrates usability and accessibility testing into your development process through a series of top-shelf tools and a network of user testers from all major disability groups.